This add-in for a OneNote Class Notebook, opened in OneNote 2013 or 2016, enables teachers to save time and work even more efficiently with their Class Notebooks. To download the add-in go to http://www.onenote.com/classnotebook. For Help and Support, visit the Class Notebook add-in Support page or file a support ticket at https://aka.ms/EDUSupport. 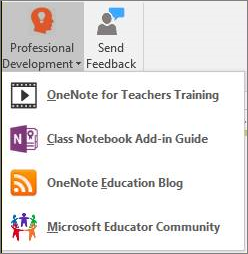 When the Class Notebook add-in is installed, you'll find the Class Notebook tab in OneNote 2013 or 2016. Each of these buttons launches a browser to access the Class Notebook app in Office 365. You would then manage each of the functions in Class Notebook online. This button brings together useful resources and additional information and tips. The Send Feedback button on the ribbon lets you send feedback directly to the development team. Click it, and your default mail client opens, ready to send us an email. IT Administrators can deploy the Class Notebook Add-in broadly across a school or district. Instructions on how to do this can be found on the Download Center at https://www.microsoft.com/en-us/download/details.aspx?id=51934. To deploy the Class Notebook Add-in with specific LMS or SIS information pre-configured for teachers, please visit the Group Policy page at https://aka.ms/classnotebookaddingrouppolicy. We've worked hard to bring the best possible experience with this private alpha. Even so, you may hit snags. A few common issues and their workarounds are noted below. [Bug] Notebook ID was not permanent, causing existing notebook mappings to disappear randomly. This has been fixed, but it will cause a one-time reset of all existing notebook mappings. [Bug] The Map Class Notebook dialog box was not displaying correctly at 125% window scaling. This has been fixed. Fixes for different LMSes - Firefly and Rediker etc.